DA Form 5646 - also known as the "Statement Of Conditions Of Service - Active Guard Reserve (agr)" - is a Military form issued and used by the United States Department of the Army. The form - often mistakenly referred to as the DD form 5646 - was last revised on March 1, 2017. Download an up-to-date PDF version of the DA 5646 below or request a copy through the chain of command. 10 USC 672 (d) and Executive Order 9397, 22 November 1943.
ordered to active duty with their consent in an Active Guard/Reserve (AGR) status. upon entry, or continued services on, active duty in an AGR status. Disclosure is voluntary; however, failure to provide information may impede processing of this application packet. A. 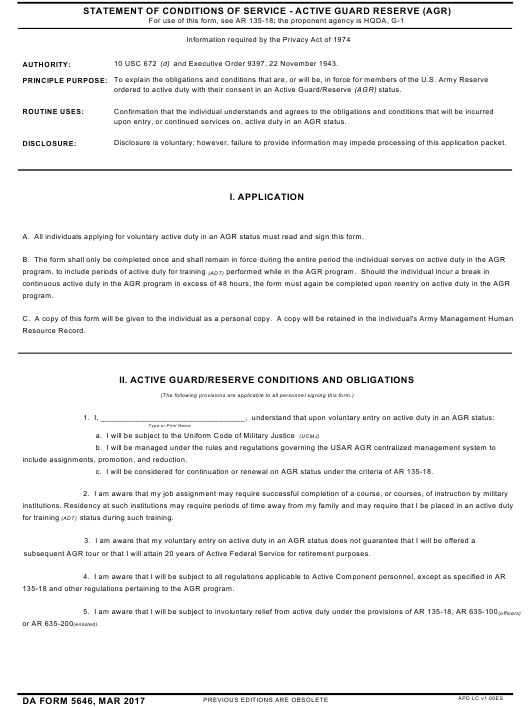 All individuals applying for voluntary active duty in an AGR status must read and sign this form. include assignments, promotion, and reduction. c. I will be considered for continuation or renewal on AGR status under the criteria of AR 135-18.
subsequent AGR tour or that I will attain 20 years of Active Federal Service for retirement purposes. 135-18 and other regulations pertaining to the AGR program. tour I will be subject to paragraph 8 below. needs of the Army at any time. active duty or I will be obligated to serve on active duty for the period of that tour. I, the undersigned, acknowledge that I have read and understand all of the conditions and obligations of service as specified on this statement. No other conditions or promises were made to me in conjunction with my entry or continuation in the AGR program.